A PhD in Art and Design will help you create opportunities to develop research skills that support professional practice, research and/or academic careers within the fields of art, design and the creative industries. You will study in a world-class research environment which enables both practice-led and/or entirely text based PhD research to be developed to the highest level. A PhD enables you to follow a programme of self-directed, independent study, supported by experienced supervisors who are themselves experts in their area. You will also be supported by the wider research community in Art and Design and you will have regular opportunities to attend research seminars, conferences and symposia. Our PhD gives you the opportunity to spend time researching and developing a deep understanding of a unique area of interest whilst contributing world-leading insight to the academic specialisms in Art and Design at Birmingham City University. It opens doors to other institutions and to world leading researchers and facilities as they take PhD research here seriously and they are interested in collaboration. It’s a two way process. When you join us you will become a member of the thriving research culture in Art and Design at Birmingham City University across the Schools of Architecture and Design, Art, Fashion and Textiles, Jewellery and Visual Communication. You will study in a world-class research environment which enables both practice-led and/or entirely text based PhD research to be developed to the highest level. We support a range of thesis submissions, including a combination of written and practice elements as well as a traditional written thesis. Whether based in the contemporary Parkside building, or our historic School of Art and School of Jewellery buildings, our research students have access to dedicated workspace that acts as the hub of our PhD research activity. You will be guided in your PhD research by a team of supervisors who you will meet on a regular basis to review your progress and plan your next steps. You will be encouraged to organise your research as a programme of professional and academic development tailored to your individual interests and career aspirations. For example, you can strengthen your PhD research and personal/professional development by participating in wider international research communities and conferences, and by helping to teach degree modules to undergraduate students. On successful completion of your PhD research degree you will have either contributed new knowledge or extended existing theory and understanding of an area of interest and significance within the fields of art, design and the creative industries. If you’ve got any questions about the course, we’d love to hear from you. Please email the Doctoral Research College. Find out about applying for funding for this course. PhD degrees are research programmes. They allow you to learn as you work through the issues associated with solving a particular problem. Each research degree student is supported by a team of supervisors appointed for the particular study. In all years of study, students will be required to present their work in meetings of fellow students and staff conducting parallel research. Research in Art and Design takes place within and across five schools (Art, Architecture and Design, Fashion and Textiles, Jewellery, and Visual Communication), as well as through faculty-wide clusters. Researchers in Architecture and Design have broad interests in the built environment and urban landscapes. Their focus is often on relationships with the body, the senses and wellbeing as well as the cultural contexts in which users encounter architecture and design. Supervisors: Susanne Bauer, Sandra Costa, Ana Rute Costa, Christian Frost, Maria Martinez Sanchez, Kathryn Moore, Jieling Xiao. The increasingly political dimension of contemporary art has given rise to a number of important questions about the role it plays in society today. We focus on the political dimensions of cultural production and, specifically, the extent to which art as a form of activism reflects upon, intersects with and, invariably, seeks to define debates within civil society, political movements, and social practices. In short, researchers in the Art Activisms cluster at Birmingham School of Art aim to challenge and extend the potential of contemporary art to change the world. Supervisors: Anthony Downey, Jonathan Harris, Susan May, Lisa Metherell, Nuria Querol, Theo Reeves-Evison, Linda Stupart, Sian Vaughan, Gavin Wade, Stuart Whipps. As a leading research cluster in the UK, the Centre for Chinese Visual Arts (CCVA) aims to foster new understandings and perspectives of Chinese contemporary arts, design, media and visual culture through curating exhibitions, interdisciplinary practices and academic research. With extensive regional to international partnerships, CCVA brings together artists, designers, curators and researchers who are working with, or are interested in the contemporary contexts of China, Hong Kong and Taiwan in order to share expertise, understanding, critiques and ideas of innovation. Using its unique position in the UK, CCVA continues its transcultural dialogues by questioning the existing histories of Chinese contemporary arts, design media and visual culture, while fostering new ways of thinking and modes of knowledge in relation to today’s global-Chinese situation. Supervisors: Joshua Jiang, Jonathan Harris, Nuria Querol, Jieling Xiao. The Centre for Printing History and Culture is a joint initiative between Birmingham City University and the University of Birmingham. It encourages research into all aspects and periods of printing history and culture, as well as providing education and training into the art and practice of printing. The Centre aims to provide a means of exchanging information, skills and expertise in printing history and culture; to engage in ground-breaking interdisciplinary research; forge partnerships in order to encourage the investigation and understanding of printing history and culture; and promote the transfer and exchange of knowledge of the subject amongst individuals and within communities and institutions. Supervisors: Caroline Archer, Christopher Hill, Susan May. Craft Cultures provides a forum to explore the multidisciplinary characteristics of craft and its praxis. A core objective is to encourage research and understanding into all aspects of craftsmanship, from the creation of the object through the design, technology and material to the role of the object and how it engages and communicates with maker, wearer and audience. Craftsmanship is explored through two main themes: Craftsmanship as the creative endeavour - in the context of: heritage, contemporary practice, traditional and digital innovations, and the sciences; and Craftsmanship and its impact on - individuals, relationships, shared experiences and the wider society. Supervisors: Stephen Bottomley, Ann-Marie Carey, Sarah O’Hana. Dress in Context is concerned with dress in all its manifestations, and its relationship to the individual and society. Dress is not restricted to clothing and fashion in the conventional sense, but encompasses all forms of personal adornment and self-presentation. We welcomes doctoral projects that examine dress from a range of perspectives, including fashion theory and design, technology, psychology, sociology, literature, history, and art. The cluster includes researchers from a variety of backgrounds, and places emphasis on working collaboratively with academics from other institutions as well as building bridges to those from outside the academy. Supervisors: Anne Boultwood, Dilusha Rajapakse, Hye-Won Lim. Through the Material Encounters cluster our researchers extend and interrogate the boundaries of materiality within the context of contemporary art. The broad range of individual research concerns include interests in the collaborative idiom through co-creation, performance and participation and ethico-aesthetics. Notions of the body both as physical object, a vehicle for encounter, as embodied subject in the environing natural world of objects tie the diverse practice of researchers together. The cluster provides a critical intellectual space for the exploration of embodiment, subjectivity and aesthetic practices as they are encountered through material and theoretical investigations. Supervisors: Catherine Baker, Lisa Metherell, Jacqueline Taylor, Esther Windsor. Performance Research is an interdisciplinary cluster working across the faculty of Art Design and Media with concentrations at Royal Birmingham Conservatoire and in Art and Design. It produces world-leading work in three strands - performing arts, music performance research and trans/multimedia arts. Art & Design Supervisors: Jonathan Day, Maria Martinez-Sanchez, Ravi Deepres. In summer 2015, researchers from BCU's Strategic Creativity Lab took a team of creative entrepreneurs from Birmingham to meet with a similar group in Mexico City. In a project funded by the British Council, the two teams came together to explore the possibility of transferring creative innovation concepts and tools across international boundaries. In a project that focused on the development of high-end gastronomic concepts from traditional Mexican street food, the researchers worked over five intensive days to create a spectrum of new, commercially actionable food and dining experiences. The project was hailed as a major success, not only in the development of exciting, novel food products, but in proving that service innovation models and toolkits developed for European markets can be adapted successfully for deployment in growing and developing economies. 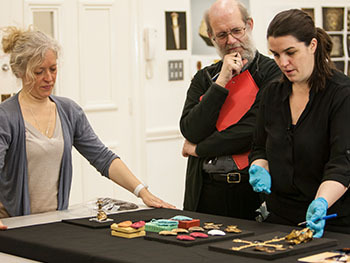 Researchers and experts from the Jewellery Industry Innovation Centre (JIIC) at the School of Jewellery used 3D scanning and printing technology to recreate some of the hoard’s most precious items for future generations to study and enjoy. The research work involved in collaborating with conservators and preparing the replicas has resulted the generation of significant new knowledge in 3D measuring techniques, increased our understanding of historical production and craft processes, and pushed the boundaries in 3D printing involving precious metals. If you’re unable to use our online application form for any reason, please email Research.Admissions@bcu.ac.uk.The University reserves the right to increase fees in line with inflation based on the Retail Prices Index or to reflect changes in Government funding policies or changes agreed by Parliament up to a maximum of five per cent. To apply for our Art and Design PhD research degree you should have, or expect to be awarded, a Masters degree in a relevant subject area from a British or overseas university. Exceptional candidates without a Masters degree, but holding a first class Bachelors degree in a relevant subject area, may be considered. We also welcome enquiries from potential PhD researchers without formal academic qualifications but with appropriate levels of professional experience. If you intend to take a practice-led research approach to your PhD study, then you will expected to show your portfolio as part of the application process, normally at the formal interview stage. Valid Academic IELTS certificate with overall score of 7.0 with no band below 6.5 or equivalent. Please send us an initial PhD enquiry containing your brief PhD research proposal (max. 500 words), and/or any questions or queries you may have. We will review your initial enquiry to ensure your research proposal compliments one of our PhD research interests and if so we will ask you to make a full application. Explain why this research is needed. Outline previous work in the field (if any exists). Explain what methods you will use to conduct your research and why? Explain the reasons for your choice of methodology and why it is appropriate. Try and think of potential problems that you may encounter. Are there specific facilities that you will need to conduct your research (e.g. materials, hardware or software)? If so are these already in place? How do you propose to fund your research? What do you imagine the wider benefits of this research will be? Who will be interested in your work? What are the key texts, sources and interlocutors that you are engaging with now, and plan to engage with during your research. You may wish to upload supporting documentation, for example if you proposing research that will be practice-led or practice-based, then we will need to see evidence of your creative and professional practice. As each PhD is an individual research project, it is impossible to specify what additional costs may be incurred. Whilst we are able to offer limited financial support towards the direct costs of research (e.g. the purchase of books or digital reproductions of primary sources; attendance at conferences and workshops, etc.) you may need to supplement this. Any potential costs should be identified in your application. Our PhD section is the place to go for application tips, FAQs, funded opportunities, helpful blogs and more! Our PhD in Art and Design gives you the opportunity to spend time researching and developing a deep understanding of a unique area of interest whilst contributing world-leading insight to the academic specialisms in Art and Design at Birmingham City University. You will present your research developments regularly to supervisors and have opportunities to present to the research community at various events across the Faculty. Full-time students are expected to complete within three to four years, whilst part-time students may take four to seven years. In your first year (two years for part-time students) you will spend time reviewing the field and refining your individual PhD research proposal and projected plan. You will be supported in this by your supervisory team and through attendance at the PGCert in Research Practice, which runs for the first semester of your studies. At the end of your first year (second year for part-time students) you will complete a Progression Assessment Panel. Your second year (years three and four for PT students) is likely to be spent undertaking in-depth research in your chosen area, with the third year (years five and six for part-time students) focused more on writing, preparing and finalising the format of your PhD thesis for examination. Your thesis will present your findings in a suitable format for your research topic (whether that be through artwork, artefact, exhibition, performance, or as an entirely written thesis). On successful completion of your PhD research degree your findings will have either contributed new knowledge or extended existing theory and understanding of an area of interest and significance within the fields of art, design and the creative industries. You will have proven yourself as a scholar, be an expert in your field and be eligible to use the title ‘Doctor’. As a PhD research student you will be guided through your programme of study by a team of supervisors. Your supervisory team will include a Director of Studies whose role it is to ensure that you are meeting targets and following the correct processes and systems for conducting PhD research. You will also be supported by a second supervisor (and sometimes a third) who will provide guidance based on their specialist knowledge of your specific PhD research interest. You will meet with your supervisors on a regular basis to review your progress, receive advice and plan the next stages of your PhD research. Our PhD programmes are offered full-time and part-time. We do also occasionally consider proposals for part-time distance learning. These modes of study ensure that we can create a PhD research plan around your lifestyle needs, even if you are in full-time employment. As a full-time PhD research student you will undertake much of your research on campus using the facilities at Birmingham School of Art, Birmingham School of Jewellery and/or the Parkside building as appropriate to your research project. You will usually spend at least 37 hours per week engaged in research. You will be expected to complete your research and submit your work for examination within 36-43 months. You can chose part-time PhD research if you opt to study whilst in employment or if full-time study is impractical. You will be encouraged to use the campus facilities when you can and may often work from home. You will usually spend at least 14 hours per week engaged in research. You will be expected to complete your research and submit your work for examination within 48-72 months. Distance learning is possible, under carefully controlled circumstances, if you normally live outside of the UK but wish to conduct PhD research with Birmingham City University. You will still be required to have some level of face-to-face engagement with us each academic year, often by conducting research on campus in Birmingham (UK). Face to face research will be arranged for a period of time during the summer months, or at a mutually agreed time. We support both traditional PhD research presented through an academic thesis and practice-led PhD research. Your thesis will present your findings in a suitable format for your research topic (whether that be through artwork, artefact, exhibition, or performance). We support a range of thesis submissions, including a combination of written and practice elements as well as a traditional written thesis. Both routes will require you to conduct a piece of unique PhD research, submit a thesis for examination and sit an oral exam (viva voce) in which you defend your thesis before a panel of experts. For the first six months of your PhD you will undertake the PGCert in Research Practice, which is a taught and compulsory part of the PhD programme. You will meet with your supervisors and attend classes every week. This is an essential part of the PhD which will help you to get your research started and set you up for the rest of your PhD journey. The PGCert programme covers literature review and research methods which are specific to your faculty. You will also be supported through the activities of our PGR Studio. The PGR Studio seeks to promote an experimental, creative and practice-based space that resonates across all the academic Schools and disciplines in the Faculty of Arts, Design and Media. A studio can be an artists’ studio, a design studio, a recording studio, a rehearsal studio or a writing studio. You can also strengthen your PhD research and personal/professional development by participating in wider international research communities and conferences, and by helping to teach degree modules to undergraduate students. The Doctor of Philosophy or PhD is recognised worldwide and is often an essential requirement for those wishing to follow an academic or research career in the fields of art, design and the creative industries. Our Art and Design PhD research degree will help you create opportunities to develop research skills that support your professional practice. We recognise that in our fields academic work is often combined with professional creative practice in portfolio careers. Our PhD graduates often continue their research through post-doctoral fellowships and academic posts. Our graduates have also gone on to successful professional careers in a diverse range of fields and role including as artists, designers, architects, consultants, curators, writers and managers. PhD researchers funded under the Midlands3Cities Doctoral Training Partnership have the opportunity to undertake industry placements as part of their research. For more information visit the Midlands3Cities website. For those students not funded by Midlands3Cities, the PhD still allows you the opportunity to work with other institutions and companies as part of your research. You can discuss your options with your potential supervisors, if you feel a placement would benefit your research. The Doctor of Philosophy or PhD is recognised worldwide and is often an essential requirement for those wishing to follow an academic or research career in industry or commerce. Our Art and Design PhD research degree will help you create opportunities to develop research skills that support professional practice, research and/or academic careers. Before you apply for our Art and Design PhD, please send us an initial PhD enquiry containing a brief overview of your PhD research proposal. This gives us an opportunity to discuss and focus your PhD research before you make your final online application. The Birmingham School of Art has a dedicated gold-standard peer review research journal, Zetesis: The International Journal for Fine Art, Philosophy & the Wild Sciences, a professional gallery - ARTicle Gallery, and world leading press - ARTicle Press. Your research environment in the School of Art will include state-of-the-art metal workshops, print-making facilities and large studios all housed in the beautiful purpose-built 19th century Victorian building on Margaret Street, Birmingham City Centre. Located next to the city centre’s Birmingham Museum and Art Gallery, the School is just a five-minute walk from the new Library of Birmingham and Ikon Gallery. Our internationally renowned School of Jewellery is the largest in Europe, with unrivalled facilities and expertise. Located in the heart of Birmingham’s famous Jewellery Quarter, the School was founded in 1890. The Vittoria Street building’s historical facade conceals a contemporary environment including workshops, a specialist library, an atrium gallery and exhibition space. Fashion, Textiles and 3D Design, and Visual Communication. Our art and design students work from a core of workshops in the centre of the five-floor building, with studio space around them. There is also ‘collision space’ where students and staff from different courses will see each other to pass the time of day, and exchange thoughts and ideas. The Parkside Gallery is a leading art and design exhibition space within the Parkside Building, with an emphasis on, but not confined to, design-led practice. Art & Design PhDs are overseen by Sian Vaughan and Jonathan Day. All our PhD students are hosted within an academic School, although as we encourage interdisciplinary research, supervisors may be appointed from across our Schools. Dr Vaughan oversees PhDs in the School of Art, and the School of Fashion and Textiles. Dr Jonathan Day oversees PhDs in the School of Architecture and Design, Jewellery and Visual Communication. Dr Sian Vaughan (nee Everitt) is currently a Senior Lecturer in the School of Art, Research Degrees Co-ordinator for Art and Design, and the Keeper of Archives for the Faculty’s Art and Design Archives. Jonathan Day works as an academic, a musician, a writer and an image-maker. He is Associate Professor of Transmedia Arts, Associate Director of Research, Art and Design and Co-director of the Performance Research Cluster at Birmingham City University. He has released a series of musical recordings, published four books, one of which has been translated into Chinese, numerous articles and has been anthologised on a number of occasions. Jonathan performs internationally, most recently in Australia, Hong Kong, China, India, Finland, Thailand and Cyprus. His releases include Postcards from the Road (University of Chicago Press), Atlantic Drifter (Proper Records), The Politics of Navigation (VDM), Carved in Bone (Proper Records), The Stain of Time (Aalto University) and The Dim Lit Subterranea of the Ancient Mind (Princess Galvani Vadhana Institute of Music Press). A new recording A Spirit Library, and a new co-authoured book Art and Terrorism are out this year. His work has been called “Seductive, complex and poetic” ARTnews magazine, New York, “Scratching at the transcendent” the Independent, London, “Expansive, intelligent and eloquent” South China Morning Post, “Breathtakingly beautiful” Folk Radio UK, “Visionary” fRoots magazine, “a voice like Scott Walker and Jim Morrison – dark as chocolate on a still night” Stirrings Magazine, “Stunning” Bob Harris, BBC.